The holidays are coming up fast behind us like a frantic reindeer with rabies and you know what that means: it’s time to buy presents! It hasn’t been easy for toy stores ever since Amazon came along and made speed-ordering Hatchanimals or whatever children obsess over these days ridiculously easy; even Toys ‘R’ Us recently closed up shop around the country. And FAO Schwarz, the legendary Manhattan toy store famously featured in the movie Big (where Tom Hanks dances on a giant piano), closed a few years ago due to rising rental costs in the city. But the store and its slightly terrifying giant talking clock are back, just in time for you to buy all the tots in your life lavish gifts. 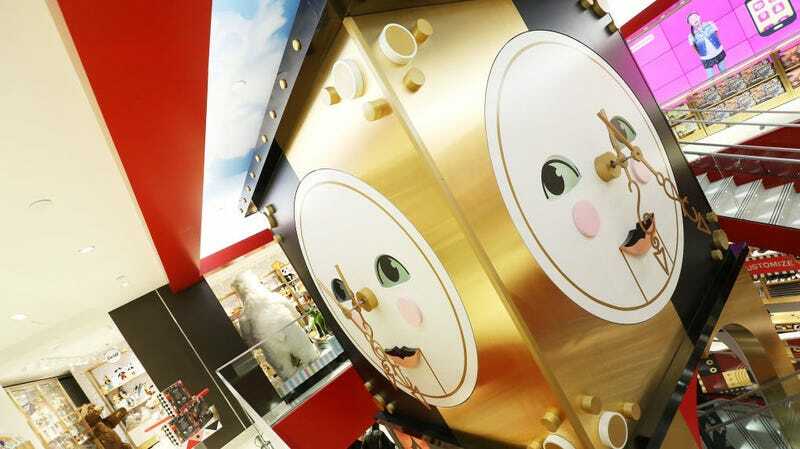 The store now exists at Rockefeller Plaza in Manhattan and looks just as over-the-top as it used to, with giant teddybears, a racetrack for kids’ cars, a candy shop, and of course the floor piano, CNBC reports. Even if retail shops are closing, you really can’t replicate the joy of a child walking into a toy store and freaking out, an experience FAO Schwarz has smartly seized upon.